Medtronic MiniMed's current Paradigm 522 and 722 or x22 insulin pumps are nearly identical to the x15 pumps except for the addition of a graphical readout for the Paradigm RT continuous monitor. Medtronic's Paradigm RT system consists of a plastic base with a sensor wire that is inserted using a 25 gauge needle through the skin,a radio transmitter attached to the skin in a separate location and then connected to the sensor base via an external wire, and the pump screen that displays the readings. In the current setup, the sensor is attached to the skin and a radio transmitter that is 1 3/8 inches in diameter is attached nearby. The transmitters is now built by hand until a new and smaller transmitter and automated manufacturing facilities receive FDA approval. The next version of the transmitter will attach directly on top of the sensor and be closer in size to the current small Dexcom sensor/transmitter. The ability to display readings from a continuous monitor on a pump rather than having to carry a second device is attractive. One disadvantage of combining devices is that the screen size on the current pump is small compared to systems like the Dexcom STS and the Abbott Navigator which have larger and crisper displays. Another disadvantage is that the RT system is reported by clinicians who have patients on all three con mon systems (Paradigm RT, Dexcom STS, and the not yet released Abbott Navigator) to be the least accurate. Readings can be 30, 50, or more mg/dl high or low, so when treatment with insulin or carbs appears to be needed based on the RT readout, the RT's reading must be verified by a fingerstick before any action is taken. Read our study comparing two different continuous monitors with an Ultra fingerstick meter. Test results are transferred from the sensor/transmitter to the pump by radiowaves. The radio transmission has a short range. This does not create problems on airplane flights, but cell phone and microwave interference may occur on occasion. When infrequent interference occurs, readings will not be visible on the pump, but the Medtronic transmitter remembers the last 40 minutes of readings and the receiver catches up once it is back in range. This may occur in other situations, such as when showering. Insurance coverage for this $1000 device plus $350 a month cost for sensors has been very limited and this has kept demand low to this point. It is especially important to use an accurate glucose meter to calibrate the RT continuous monitor. Among more accurate meters are the Abbott meters that use Freestyle strips, Lifescan meters using Ultra strips, and less expensive Wave 1 and Wave 2 meters by Agamatrix. The 522 and 722 pumps differ from each other only in size of the reservoirs (176 versus 300 units) along with a smaller overall case size for the 522. Power is provided by a single AAA battery. Basal rates can be adjusted in 0.05 unit increments, while bolus increments are still in 0.1 unit steps, compared to 0.05 in the Animas IR1250, the Cozmo, and the OmniPod pumps. Users can set carb and correction factors with different ratios at different times of day. Backlighting is available as is a lockout feature for children. Reminders can be set for taking boluses at specific times each day, to alarm a half hour to five hours after boluses or after low or high blood sugars, and to replace the infusion set in three or four days at a particular time of day. Try Medtronic's Pump School Online to learn more about this pump. Currently, four infusion sets (Silhouette, Sof-set, Quick-set, and 30 degree bent metal needle) are available from Medtronic for the Paradigm's proprietary connection. In addition a Luer lock connection is available from SpectRX called Simple Choice that will work with the Paradigm. To use standard Luer lock infusion sets on a Paradigm, visit the Applied Diabetes Research site to order their special reservoir for the Paradigm. The pump screen on the x22 times out quickly when a bolus is interrupted by a phone call or other life event, or when loading and priming the pump. Unlike other pumps where the screen might time out but bring you right back to the part of the load process you were involved in, when the x22 pump's screen goes off, the user has to retrace their steps to where they were. 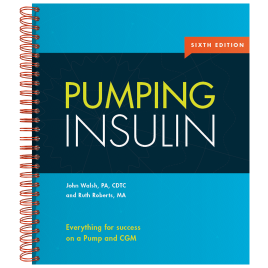 Users can set the duration of insulin action to values between 2 and 8 hours in one hour increments, compared to 15 or 30 minute increments available in other pumps. The default value of 6 hours is very reasonable on this pump. See setting the duration of insulin action for more detailed information on this important setting. The x22 pumps continue to use the Link meter which allows direct entry of glucose readings into the pump, although the manufacturer, Becton Dickinson chose to discontinue it's Logic and Link meters and strips in September, 2006 due to lack of profitability. Complaints about the lack of accuracy of this meter have been received from users. Pump data can be downloaded from a PC to the Medtronic CareLink® Therapy Management website or to a PC using a new Medtronic cable. A Windows computer with Internet Explorer is required. Similar to the cost for previous software upgrades, the cost to upgrade from the older x15 pump to a new x22 pump costs $799. A $400 rebate is received once the current insulin pump is returned to Medtronic in the postage-paid envelope that is provided. Verdict: A solid pump with simple operation. Avoid the continuous monitor until accuracy improves. Before bolusing, monitor Bolus Wizard recommendations by checking active insulin. 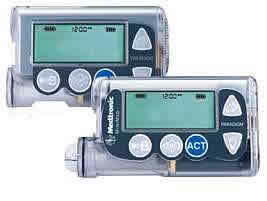 Some pumps, such as the Deltec Cozmo, balance any active bolus insulin against both carb and correction boluses. In contrast, the Paradigm series pumps (x11 through x22), as well as the current Omnipod pump, ignore active insulin or Bolus on Board for all carb boluses. In some situations, such as when carb boluses are given within 2 or 3 hours of each other, as occurs in children and adults who like to snack, the Paradigm pump may recommend carb boluses that are too large and cause unnecessary hypoglycemia. For example, a pumper has given an earlier bolus that was too large and happens to have 5 units of active insulin on board a couple of hours after their last bolus. If their blood sugar is 108 mg/dl (6 mmol) and they eat a snack that requires 3 units to cover it, the Paradigm and Omnipod pumps will recommend giving 3 additional units. In the same situation, the Cozmo pump will recommend that no bolus be given or that some additional free carbs may be needed to offset the remaining bolus insulin. The Animas pump, meanwhile, will discount for active bolus insulin if the person's blood sugar is below their selected target, but give the full calculated carb bolus of 3 units if their blood sugar is above target. A Paradigm user can double check the recommended bolus if they hit the down arrow three times to scroll down on the screen where the bolus recommendation is given. They will see entries for the meal bolus, correction bolus, and active insulin. They can then decide whether to subtract the active insulin amount from both the carb and correction bolus amounts to reduce the risk of a low blood sugar. For pumpers who have frequent highs because their basal rates and bolus doses are too low, some excess bolus insulin may not be much of a problem. However, in situations like that discussed above, a pumper might go low if they follow the pump's recommended bolus dose. Some pumpers who have gone low in this situation have mistakenly blamed the lows caused when the Paradigm does not account for all of their active insulin as being caused by excess basal insulin and have unnecessarily lowered their daytime basal rates to solve the problem. Medtronic administration and engineering personnel are aware of this situation. Whether they will remedy this in software upgrades is unknown. The cost of recalling pumps, the time required to retrain users, and an adamant demand by some pumpers that this approach not be changed may be causing a lack of action. Omnipod administrators discussed the issue prior to release of the Omnipod and decided upon a Medtronic approach to their bolus recommendations. They are aware of the pitfalls and are currently considering whether to change bolus recommendations in their next generation Omnipod. Software and hardware improvements to the 511 pump to prevent loss of basal rates has resulted in the "save settings" feature on the x15 and x22 series. This allows the current pump settings to be saved for recovery if basal rates are inadvertently lost. The battery can now be removed for at least 30 to 40 minutes before the time setting is lost. Pump settings and basal rates can also be saved to the pump or to a PC. Other pumps so rarely experience this problem that they do not require this type of backup, but all pump wearers should keep a written record of current settings in case disaster strikes. In the utilities section, one option near the bottom is "clear pump". It means exactly that---all basals and history are erased when this option is selected and agreed to. It was placed into the pump at the request of sales reps and pump trainers who use pumps to show various scenarios which they then clear. But it can create problems for the unaware user. The risk of this is low, but a teen may decide to clear their pump as a way to erase the size or incompleteness of their boluses. The pump may also be cleared if a user mistakenly thinks it is a good way to silence an alarm, or if someone accidentally presses the wrong sequence of buttons because they are hypoglycemic or distracted. Once the pump has been cleared, an alarm will warn that the clock setting has been lost, but no warning is given that the basal rates have also been erased. O-ring leaks may rarely occur inside a reservoir. The reservoir above came from a 64 year old woman who arrived at a clinic one morning with a 364 mg/dl blood sugar. Usually in excellent control (70 to 120 mg/dl before meals), her glucose had been normal the night before. She said she had experienced several unexplained high readings in the previous weeks. The week before she had experienced nausea and positive ketones in the urine, with a blood sugar over 450. The source for her problem turned out to be leaky O-rings. When a single reservoir in a box leaks like this, be sure to have the entire box of reservoirs replaced. Reservoirs are manufactured from molds. These molds are routinely replaced due to wear but may occasionally be used too long. If one reservoir leaks, others with the same lot number will also be likely to leak. The woman reports that her unexplained highs disappeared once she started a new lot of reservoirs. One design issue in the Paradigm pump involves the cap on the infusion set that connects it to the reservoir and also holds the reservoir in place. This cap with coarse threading is locked in place with a half turn and is kept in place by only a small indentation in the plastic cap near the end of the threading. The Paradigm reservoir has nothing to hold it in place, so it floats on top of the advancing driver that normally pushes the plunger inside the reservoir forward. If the cap is noticed to be loose and then retightened with a half turn, most of the insulin that was not delivered during the time the cap was loose will suddenly be delivered. Unlike small amounts of insulin that might be delivered if a Luer lock connection is retightened, this half turn can deliver doses as large as 15 to 20 units, depending on how long the loose cap went unnoticed. Not realizing that this large bolus has already been delivered, the user may proceed to give an additional correction bolus for the high blood sugar. The two large overlapping boluses could cause a severe low blood sugar. If a high blood sugar occurs with a loose reservoir cap on a Paradigm pump, never retighten the cap until the infusion line has been disconnected from the infusion site. Children and active adults should not fiddle with this connection. Medtronic suggests that users keep the Paradigm pump in its protective carrying case to avoid hub detachment. An add-on safety lock was designed to prevent dislodgment, but it cannot be used at the same time as the Paradigm belt clip so most users don't use it. International Standards for Medical Electrical Equipment (IEC 60601-2-24, section 54.101) warns against floating reservoirs in medical devices, saying "means shall be provided to ensure correct clamping and location of a syringe barrel." Keeping the reservoir locked in place prevents it from floating on top of the driver. This standard was developed by experts in the field to avoid unnecessary over-delivery.